I am scheduled to speak at the 2013 DevConnections Conference, which runs from Monday, Sept. 30 through Friday, Oct. 4. The event will be at the Mandalay Bay Hotel in Las Vegas. My talk is titled “Developing Neural Networks using Visual Studio”. I will describe what neural networks are and demonstrate how to create a neural network prediction system from scratch using C# and Visual Studio. See http://www.devConnections.com. 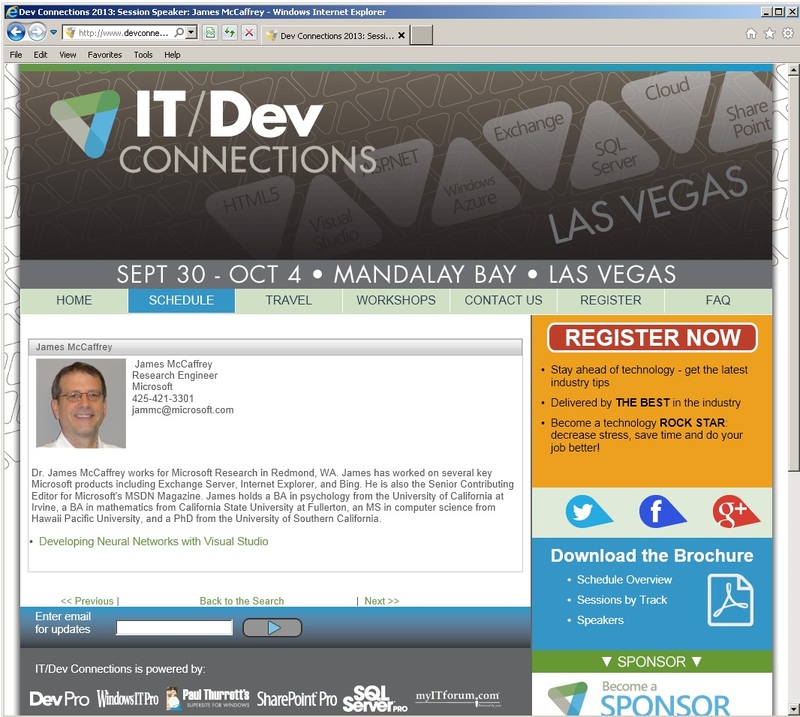 The DevConnections Conference is actually a collection of several sub-conferences for SQL Server, SharePoint, C# and .NET, Windows, and Exchange Server. The event has been around since at least 2002 and maybe longer. I always get a lot of value from going to technical conferences. In addition to the technical information I learn, I get to meet some interesting (usually in a good way) people, and get a lot of geek energy that improves my productivity when I return back to work. There has been a big increase in interest in neural networks over the past few years. It’s not entirely clear to me why this renewed interest is happening but I suspect it’s related to the rise of the Cloud and Big Data, and possibly related to new research in Deep Learning networks (which are essentially complex, multi-layered neural networks). This entry was posted in Conferences, Miscellaneous. Bookmark the permalink.